I see some are working a possible rear shock solution. I thought I'd help a bit by posting a few observations from looking into the oem shock. - free length of the spring: 7.048"
- installed length of the spring: 6.449"
- estimated stroke to the rubber stopper: 0.866"
Note: the preload of the bike was never set right/weight of the rider was great = pulverized the rubber stopper as there wasn't one on the shock. Pic 3: Gathering the data points and plotting them (using excel), you can see the spring is a 2 rate spring (red lower and blue upper) by looking at the upper curves. The red line is the lower rate = 1/0.001084 = 923 lbs/in. The upper rate = 1/0.000807 = 1,239 lbs/in. Of more importance is finding the crossover point. That happens when the equation of the 2 curves are equal to each other. You solve for the load at that crossover point, then solve for spring length when that happens. That length is equal to the total of the gaps between the tightly wound coils. Pic 4. With this information, you can determine the capacity of the spring as it is installed (the preload selector is on the 1st preload indent). The installation preload of the spring is (7.048" - 6.449") = 0.599". With 0.599" of initial preload compression, the installed crossover point is now at Y = (1.059 - .599) = 0.46". Using the calculated rates, preload distance and cross over, you can show the as designed spring capacity (see lower red/blue curves). It shows the spring doesn't start to compress until there is at least 552 lbs of force. 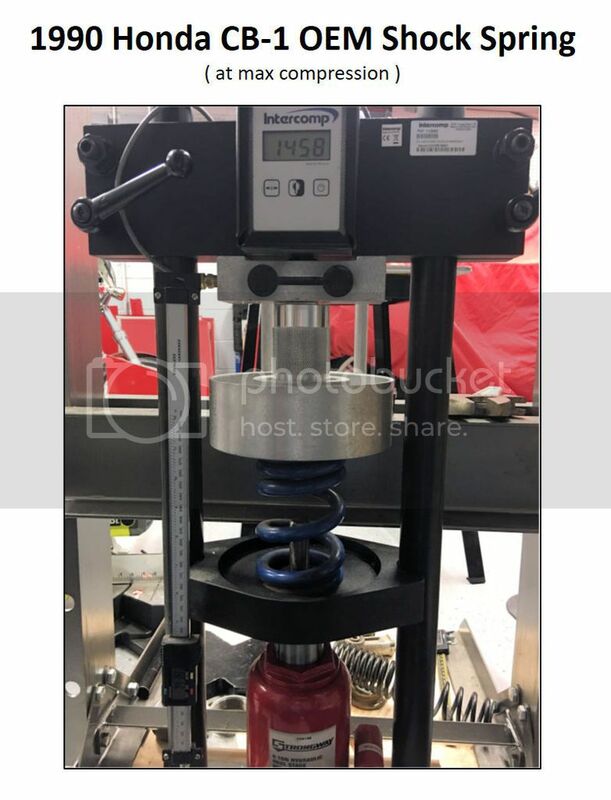 Then the spring compresses at 923 lbs/in until the spring has compressed 0.46" (all the small tight coils on the spring have compressed) and the spring transitions to the higher rate (1,239 lbs/in) and will continue to compress to a total distance of 0.866". At that point, the shock would be compressed enough to reach the rubber stopper (if it was still there). If the shock continued to compress, the spring capacity at total compression is 2,185 lbs. There is more work to fully understand the rear suspension. I need to measure the shock relationship to swingarm movement + I need to measure the damping setup of the shock. I will not be able to do the later until the shock dyno is fully set up (maybe a few months away as I have to fabricate end pieces that can hold the shock). But, this should be of sme help as you are looking for other options. I don't think a VTR shock will work as the spring is not as stout as the CB-1's. I think if you just replace the spring with an aftermarket 7" length spring with the correct rate, that might be the cheapest solution. It's a progressive spring. Since one end is would tighter, every time a coil binds the sprig effectively becomes shorter which inreases its spring rate. Clever way to give a progressive ride without linkages. The spring isn't a progressive spring. It is a 2 rate spring. I tried a 1st order polynomial curve fit through the data. It is close, but doesn't fit well at the upper range. If it was a progressive rate spring, the polynomial fit would have yielded the best curve fit (R2). Linear curve fitting the data at the bottom (red rings around the black dots) and the upper (blue rings around the black dots) yielded the best curve fits as indicated by the R2 numbers on the graph. When you look at the spring (pic 1), you can see the 2 separate coil rate windings. The top close spaced windings, compress together until they bind up. If you measured the distance between these coils and added them up, you'd get 1.063". That's when you transition to the higher rate spring that has the coils spaced much wider apart. Its impressive that they could make this kind of spring in so short of length. I have seen these 2 rate springs on other Honda bikes. The lower rate is for solo riding, and the higher rate when 2 up. The problem is that the rates are for people who don't weigh very much. For a heavier solo rider, you end up putting so much preload in to set the sag, you are almost out of the initial rate of the spring, so you are essentially riding on the upper rate of the spring. 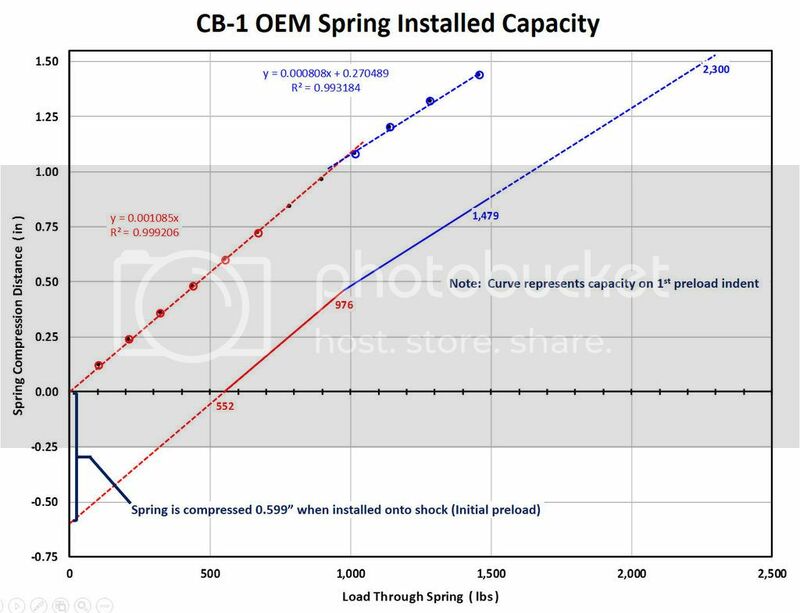 If you had a straight rate 1,200 lb/in spring preloaded at the same ~0.6", you would have a capacity of (0.6 x 1,200) + (0.866 x 1,200) = 720 + 1,039 = 1,759 lbs (vs. 1,479 lbs). That is 280 lb more capacity (~19% more capacity) than stock. 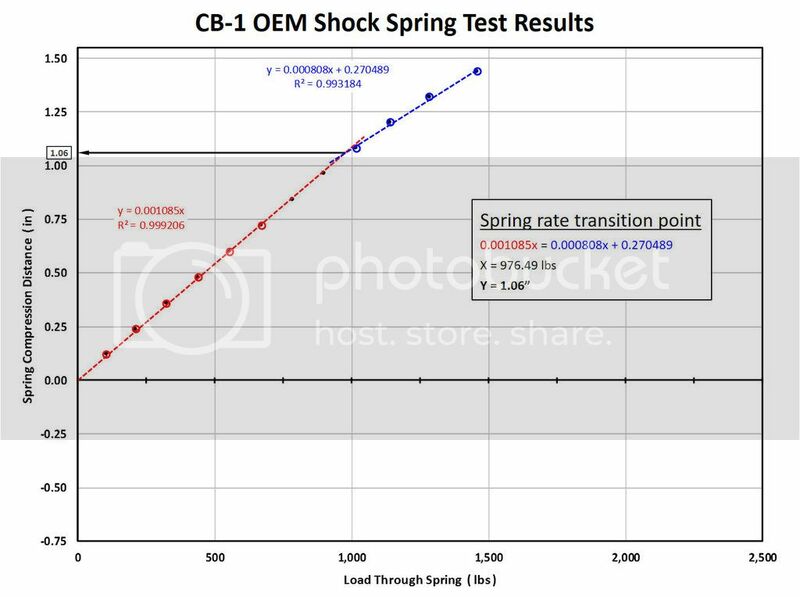 That spring spring swap (~$85) might be the only thing most riders need to do to make the shock workable for them; you would not have to revalve the shock as the new rate of the spring is close to the upper rate of the spring, so it should still work. I even think you could use a 1,300 lb/in spring (for much heavier riders) to give you (780 + 1126)-(1479) 427 lbs more capacity (~29%) more capacity and still not have to change the valving. I should also mention, the move to a straight rate spring will challenge you a bit when you are trying to measure bike and rider sag as they will be much smaller numbers than you are used to seeing. I consider that to be okay as the upper end of the spring capacity is what you are looking to gain. So, all you riders looking for a cheaper shock option, just change your spring to either a 7" x 1,200 or 1,300 lb/in spring. Once I can get some other measurements done, I can tell you what rider weights should be using what rate spring. very well calculated analysis "Spacetiger". So...change "which" spring out? 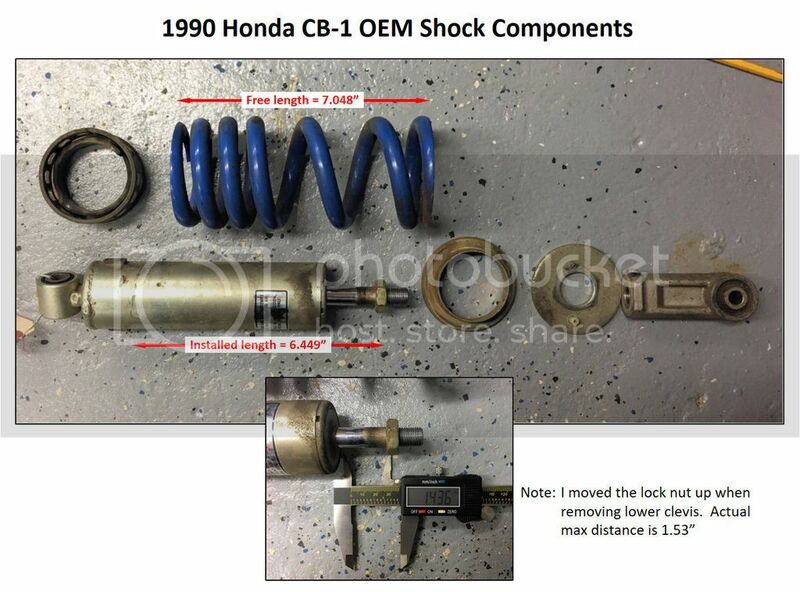 the spring out of the stock CB1 OEM rear shock to a 1200lb or 1300lb spring? Is that what your findings are indicating? That all a heavier (and much older) rider needs to do is swap the stock OEM CB1 spring to a simple 1300lb spring? wow....that's and awesome cheap fix. I am very impressed by this. Is this your job or how do you have access to this knowledge? which spring or where can you recommend purchasing a 7"x1300lb spring from? Got any dealers? And how much would something like that cost? Penske certainly used to do that. awesome!...calling Penske first thing Monday. Don't go buying stuff just yet. Even though my time is limited, you guys can do some of the work. If you just want to stay with the stock shock and you are on a very limited budget, I can guide you on how to pick a new spring that will match your weight. If 5+ riders will do the following and report back your numbers, I will be able to more precisely guide you in getting your spring rate correct. But keep in mind, this does not include sorting out the damping. You have to determine if the damping is still acceptable. Here is what 5+ riders need to do. 1. You have to insert a nylon washer onto the shock shaft so you can collect shock displacement measurements. To get the nylon washer on, you cut the washer and use a needle nose pliers to feed the washer through the spring and onto the shock shaft. You might have to turn the washer sideways to slip it on the shaft. You can get a washer for $1 at Lowes or Home Depot. Make sure the ID of the nylon washer is snug enough to hug the shock shaft. If you have to add some electrical tape around the washer to reduce the ID, that is okay. 5. Gently, let the bike off the centerstand, then put the bike on the centerstand again - do not get on the bike. The weight of the bike will compress the shock and move the nylon washer. Measure the distance the washer moved - try to be as accurate as possible, say within 1/16". It is tight in there, but if you use a popsicle stick and pencil, you can mark the distance and measure the marks after you are out of the shock spring. Then push the washer back up against the shock. This distance I will call the bike sag. 6. Now you mount the bike and gently take the bike off the centerstand. Balance yourself and lift your legs off the ground so your weight + the bikes is on the suspension. Then, dismount and put the bike back on the centerstand. Be careful not to bounce the bike. With the bike on the centerstand, remeasure how far the washer moved. This is what I will call rider sag. 7. Go measure yourself as you were dressed so I have the exact rider weight for the rider sag test. Thats it for now. If 5 of you will do this and post the results it will give me enough spread in the reported data to develop an initial sag/spring strategy if that is all you plan to do. I'm just a rider like you. I am an engineer my education and profession, so it shapes how you go about things. Because some of my more recent bikes have much more stout springs, I have found the need to get better equipment to measure and verify things. I justified it in my head as giving up one motorcycle so I can get all of my other motorcycle suspensions sorted out properly now and into the future. I found precision information on the internet is lacking because most riders don't buy this kind of equipment because of the expense. They tune by rules of thumb. The guys that have access to good equipment, don't post because that is their livelihood, so why give it away free. The technical aspects are not too difficult to sort out - if you have the right equipment. I have a very good spring tester, accurate to 2%, so I can characterize spring rates. I also recently acquired a shock dyno capable of driving shocks up to 5.5"/sec. That is plenty good enough to verify/valid shim stack setups in shocks and forks. 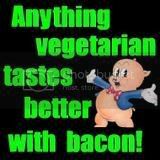 Since I don't make my livelihood this way, I will freely share with my fellow riders. Lets see how this goes. Maybe that's why they call you the "SpaceCowboy"....err...."Spacetiger" that is. Isn't there a song about a spacecowboy? I'm thinkin' of song that goes something like..."Spacecowboy...gansta of love". I know the Steve Miller Band song very well from the late '70s VintageHunter. A local band used to cover it every Sunday night at the Blessington Carriage pub. Steve Morgan, Mike Jackson and Micky ? who used to play bass - with his head in the bass bin!!! Damn! I always could remember Micky's last name. Anyway, they were great. And I'm beyond impressed by your work spacetiger. I'm an aircraft engineer by early training, but you took this thing to a new level. I love your approach to data gathering. I will endeavour to get some figures for you. Somewhere I have a good pair of inside callipers and a micrometer and dial gauge. I just need to find the right nylon washer. I'm busy building storage solutions a few miles from my bike for the next week or so, but as soon as that's complete, I'll be on the case. Not sure who sells just springs in the UK though. Still also considering playing with a Blackbird shock if one turns up cheap. I'm copy/pasting your work into a Pages document for further study. Great work bro. most excellent ModerateFkr on the possibility of gathering some data. The buy of the blackbird shock will not be a total loss as I have already bought one as they are pretty cheap. I'll do a quick check of that spring tomorrow. The reason I bought mine is to possibly contribute to the Frankenstein Showa shock build. I have not pulled mine apart, but I was betting on the lower (and long like the CB-1) spring perch can replace the CB-1's lower perch. That swap allows me to get lowspeed rebound adjustability in a shock body that didn't have one. I don't think the blackbird shock body is the best as it is not as wide as the CB-1's. The CB-1 is right at 2" so it can accommodate a bigger RT piston. That will give you more tuning options. I'm searching other Showa body shocks for lowspeed compression adjustability options via a remote reservoir. Back to length. I need a shock with a length 8mm longer than stock. I have to do a little math on another computer as I'm limited during the work week on this computer. You can lengthen the stock shock about 5mm (max). If you are on a budget and staying with the stock shock, I'll post tomorrow how to do this. If you do this, you will have to add a spacer to keep the 7" spring length under the correct amount of preload.